Encourage the motor skills in your pre-schooler with these fun exercises. Drawing and colouring in helps with the development of motor skills. Keep children interested by using different colouring in or painting tools and if they don’t like it, try tempting them with idea of decorating a T-shirt or mug. 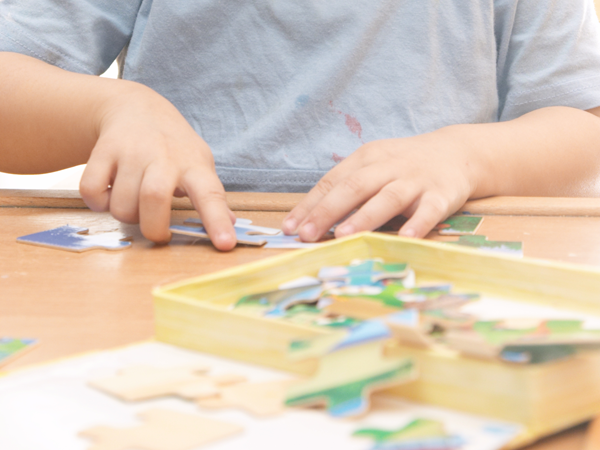 Figuring out how the different pieces of a traditional puzzle fit together is beneficial to your child, but up the skill level by introducing more difficult puzzles as well as 3D and virtual puzzle apps. Let your little one catch, hit and throw big as well as small balls outside. It’s great for hand-eye coordination. Research suggests building things is one of the most valuable exercises for a child. Use any blocks to build a model, house, vehicle or whatever your child’s imagination comes up with. Hitting a moving object will help with hand-eye skill and boxing bags are a great way to learn the art of boxing without getting a black eye. Computer, tablet and videogames encourage visual perception as well as precision hand timing. There are thousands of apps designed specifically to improve hand-eye coordination. Just remember to limit your child’s time in front of the screen. Beading, lacework, pottery, crocheting and card making are all examples of crafts that will improve hand-eye coordination. Creating something with needlework, hitting a nail into a piece of wood, gluing, cutting with scissors or moulding clay are all fun activities for your pre-schooler, as long as you keep an eye on them so they don’t get hurt. Picking outfits and putting them on a doll has great educational value. Even boys can benefit from this game, although they may prefer playing it with action figures or using farm animals to depict stories. Hitting the drums or tambourine, playing the right notes on a xylophone or strumming a small guitar are all wonderful ways to develop small motor skills. Allow your pre-schooler to use all kinds of musical instruments. Use every opportunity you can to let your pre-schooler help you bake and cook. Whether it’s spreading, measuring, stirring or licking out the bowl, they’ll enjoy themselves and develop fine motor skills without either of you realising it.